Top loading balance: Ohaus Navigator, Model N12120 with internal calibration (Ohaus Corp., Pine Brook, NJ). DXA machines in order to achieve optimal contrast in small specimens. 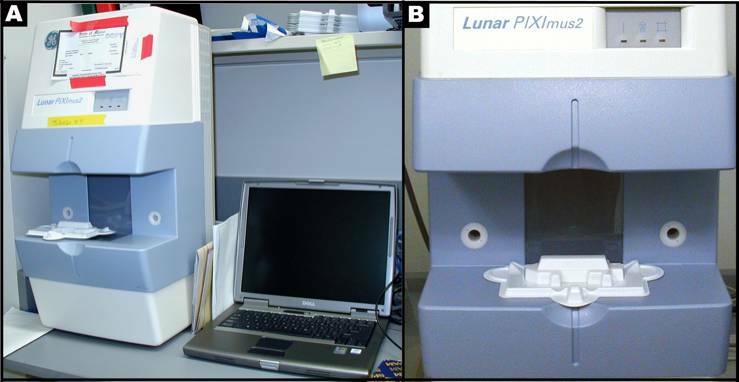 The Lunar PIXImus for rodents is a fully integrated densitometer designed for the estimation of bone mineral density (BMD) and body composition.The resolution of the PIXImus is 0.18 x 0.18 mm pixels with a usable scanning area of 80 x 65 mm, allowing for measurement of a single mouse or collections of isolated specimens. The precision for BMD is less than 1% coefficients of variations (CV) for whole body, approximately 1.5% CV for specialized regions (Nagy et al, 2000). Correlation with pQCT values for 614 isolated spinal vertebrae is significant (p<0.001; r=.704). Lily tubs: 64-oz paper bucket (Sweetheart Cup Company, Owings Mills, MD). Figure A: Lunar PIXImus2 densitometer with integrated PC computer. Figure B: Close-up detail of the Lunar PIXImus2 densitometer with specimen tray. b. Then each mouse is placed on the specimen sticky tray (body must be within blue line on the tray) under the PIXImus beam path. The tail is placed alongside the body, the front legs are extended to the side, and the neck and spine are gently straightened. 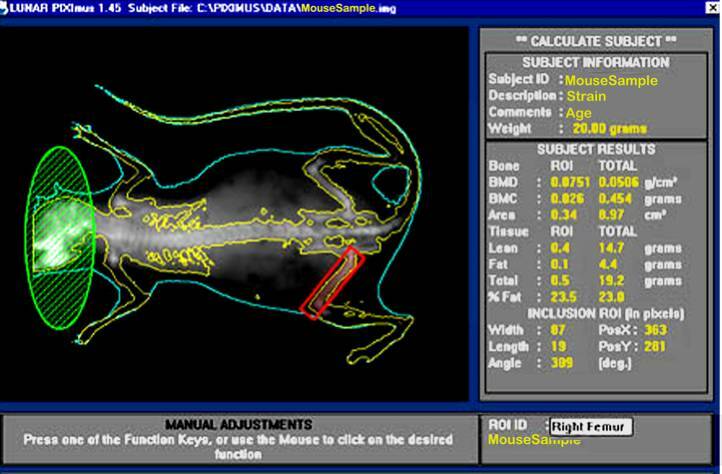 c. Trays are positioned so that the area of the head is always oriented toward the left from the investigator's point of view, and the mice are position dorso-ventral so that the entire body and tail are measured in the scan. d. The X-ray process to obtain a single full scan is approximately 5 min; specific regions of interest (ROI) are then subsequently defined. a. Based on PIXImus validation studies (Nagy, 2000; Johnston, 2005) DXA-estimated measurements of fat tissue correlate well with measurements obtained from chemical extraction. This is made possible by developing software versions with equations that adequately correct raw DXA measurements. b. Following the completion of an image scan the DXA system automatically implements specialized software to identify bone tissue from either fat tissue or from lean tissue based on the resulting X-ray densities at two distinct energy levels (Pietrobelli, 1996; Johnston, 2005). 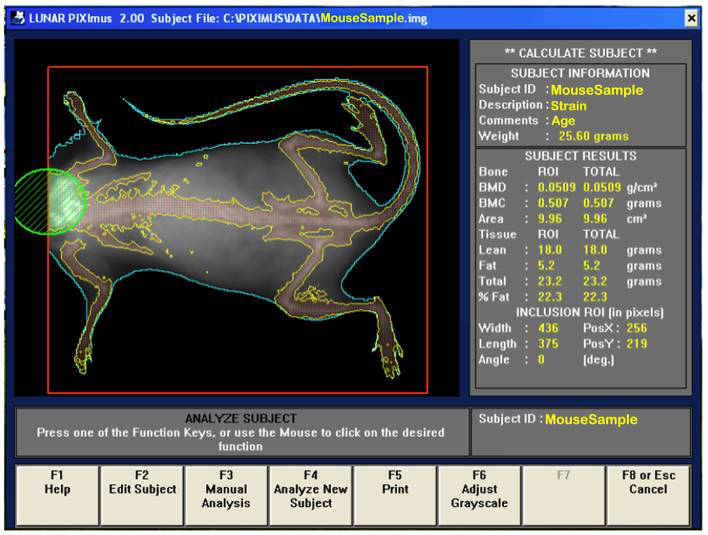 c. Visually, following the completion of a scan, the mouse sample is then outlined with red and green colored circle and square to define specific regions of interest. For safety, gloves must be worn and radiation safety guidelines are strictly adhered to, such that technicians must be behind portable shields or 6 feet away from the PIXImus machine during scanning. A dosimetry badge and ring must also be worn. Since both the PIXImus unit and the computer present icons that indicate the "ON" status of the X-ray tube with open shutters, precautions and any possibility of exposure should be avoided. Bone area measurement is generated by outlining or specifying the limits or dimensions of the entire skeletal bone regions of the body (limbs, neck, spine, and tail), excluding the head, as regions of interest (ROI) following a full body X-ray scan. Bone mineral content (BMC) is generated from PIXImus density scans which are assessed for accuracy using a set of 0.0 mg to 2,000 mg of hydroxyapatite standards. PIXImus data are obtained from the entire body and tail, excluding the head area: reported tissue variables included lean tissue weight, fat tissue weight, total body composition, and percent fat, bone mineral density (BMD), bone mineral content (BMC), and bone area.